How Many Ways Can You Stop a Pipeline Leak? Earth day will be here before you know it, but why wait for a specific day. Celebrate the Earth every day! 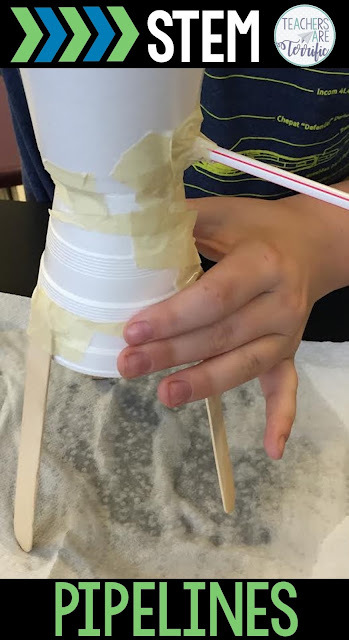 We have so many STEM challenges that we try in the spring and this one is perfect. It's the Water Pipeline Challenge! We also try Solar Ovens and Earthquake Resistant Structures! We learned first about the water pipelines in Panama. There are remote villages in that country that rely on gravity-fed pipelines to bring water to a large water tank. The villagers journey to the water tank with buckets and jugs to collect their water. We took a look at photos of the pipelines and talked about all the ways these are good and then about the problems the villagers might have with this system. This led to a very hands-on way to recreate the pipelines and illustrate just how problematic the leaks in the pipelines might be. Very eye-opening! Groups had to have a main tank that was elevated and would hold the supply of water. When this water is released it will flow through their pipeline into a holding tank at the end. Above you can see one of the dilemmas we ran into quickly. Where and how do you make a hole in the tank so the water can flow out? Many groups just punched a hole in the cup and thought the water would flow out. Notice we had towels nearby! Above you can see another group's way of making that draining hole.They used the bendy part of the straw coming out of the bottom of the cup. 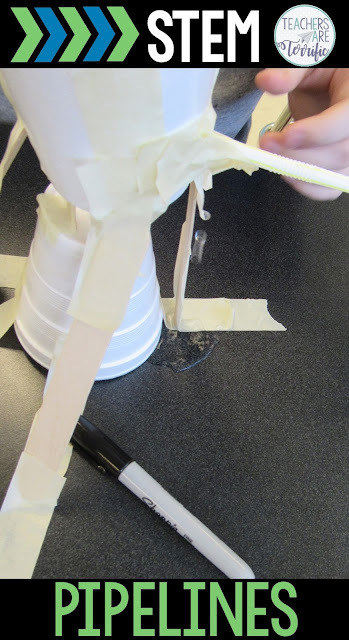 Problem #2: Masking tape can stop those leaks, but not after it gets wet! Below are a few other tanks in the process of being built or being tested. Problem #3: The elevation of the first tank and then the pipeline along its path is important. Since we are relying on gravity, the pipeline cannot be parallel to the table. Problem #4: My suggestion to you if you ever do any kind of challenge that involves water leakage is that you have REAL towels on hand. They are much more absorbent than paper towels and cheaper. I give each group a large towel and maybe some smaller ones. Later I just throw those in the washer and dryer that our school has! Can you stop all the drips? Yes, you can! I have seen several pipelines built that did not leak at all. I have seen many that have small drips- like the one below! The real-life component of this challenge is one that brings great interest and engagement to the task in our lab. Since the kids know that there are communities that have the same problems they had with their small pipelines I think they have an appreciation for the challenge. It's also really fun! Problem #5: It is really hard not to laugh while I am watching kids race around with cups and towels and their scooped hands trying to catch all the dripping water! All You Need is Sunshine and Chocolate! So Many Ways to Create an Earthquake! Can you Find the Area of Your Home Sweet Home?